I weaved in the tails of the Green Spring Shrug in time to wear it during my final course exam for Normal Body Systems 1 (NBS 1) Friday. I, at first, didn’t like how the shrug looked on me. It seemed like it would look better on someone of a taller stature. After wearing it all day Friday, I’ve changed my mind. I love it! Categories: Beth's Crafty Things | Tags: knitting, Pimlico Shrug, shrug, sweater | Permalink. I’m making the Pimlico Shrug pattern found in Knit2Together, a book by Tracey Ullman and Mel Clark. I’m using Brown Sheep Company’s Simplicity Tweed in ST12 Water Lily Leaves, which I bought at What’s Needlin’ Ewe in Mount Airy, N.C. a couple of years ago. This yarn was selected for this cardigan pattern, but it turns out the yarn is way too big. Last year, I bought a bunch of yarn at the Knit and Crochet Show in Charlotte to make the Pimlico Shrug, but all of the skeins are too small. Luckily, the Brown Sheep Company yarn works perfectly for the shrug though I was missing a couple of skeins. I ordered 2 skeins from Creative Yarns of Georgia. The new skeins aren’t from the same dye lot, but I think the colors match well enough for me to use them. Creative Yarns was the only place I could find online that still has Water Lily Leaves in stock. My stash of Water Lily Leaves is from Dye Lot 003. The Creative Yarn skeins are from Dye Lot 005. While at the Knit and Crochet Show, my sister found Yarn Pro, an iPhone app that’ll help you find suitable substitute yarn for your projects. You plug in the yard/meters and oz/grams of the yarn called for in the pattern and the measurements of the yarn you’d like to use and the app will tell you whether it’s a good idea to use the yarn. The app also helps you compare your gauge to the pattern’s gauge and allows you to compare needle sizes. The Brown Sheep Yarn happens to be a little thicker than what’s called for in the Pimlico Shrug pattern, but it’s suitable enough to use as a substitute. So far the app’s paid for itself by eliminating some frustration! Categories: Beth's Crafty Things | Tags: Creative Yarns, knitting, Pimlico Shrug, shrug, sweater, what's needlin ewe, Yarn Pro | Permalink. Just a quick update on Chris’ sweater. 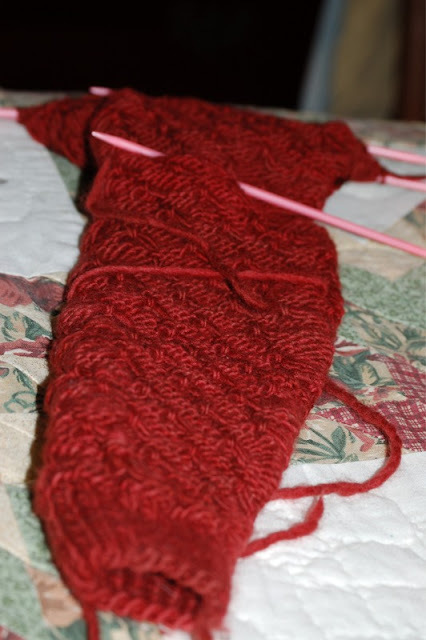 Only 2.5″ left to knit in the round before I can bind off! I’m just about finished with one sleeve! Then on to the final sleeve, assembly and the collar. As you have probably guessed, I’ve sort of dropped out of the 2011 Sweater Challenge. I should be completing sweater 3 by now, not still working on No. 1. Categories: Beth's Crafty Things | Tags: crafts, knitting, projects, sweater | Permalink. I finished these gloves earlier this week. I’ve sent an email to my friend and hope to have these in the mail in the next few days. 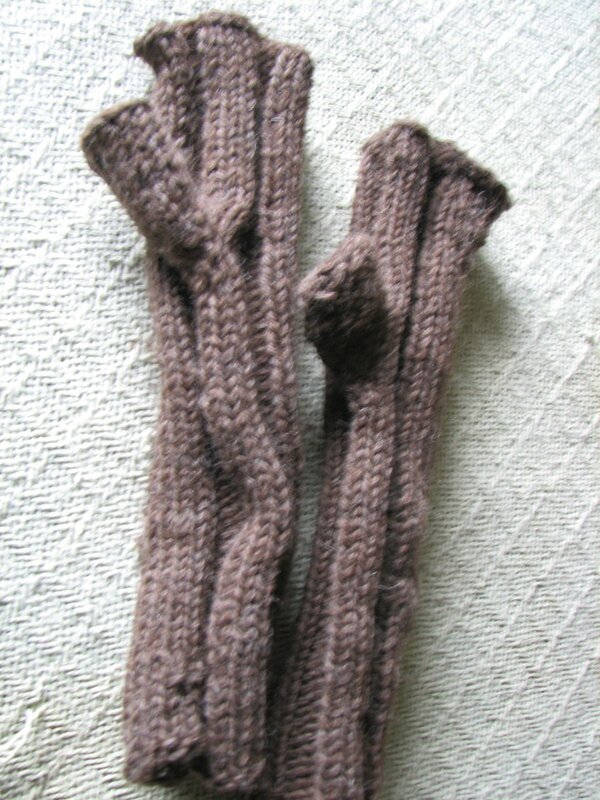 I made the fingers longer than the pattern called for in my Hubby’s Fingerless Mitts pattern. Hopefully these wool mitts will keep my friend’s husband warm in their much colder climate! A quick update and pics of Chris’ cardigan. I’m knitting the back now and will start on the left shoulder next. The sleeves are knitted in the same pattern and then sewn on later. The right shoulder is already completed, as you can see. I really like this pattern and the shape of the stitching. I have yet to get bored! The pattern repeats every 16 rows. After the cardigan is finished Chris will be able to wear it inside or out, showing the lattice (right side, which is facing) or the hollows (wrong side, seen on the left). I like the lattice-side the best. Chris picked out a blue yarn for the collar. I can’t wait to see what the color combo looks like when I’ve got them all stitched together. As a side note, I really want to get a new wide-angle lens for the Nikon D50. Chris passed down this camera to me a few months ago when he bought a D200, but the glass on the D50’s lens falls off! So I’ve been afraid to use it and it’s been sitting in its case. I really prefer the D50 much more than the Canon PowerShot I’ve been using. Case in point, check out these horrid photos I also took today of the gloves and cardigan. Categories: Beth's Crafty Things | Tags: cameras, cardigan, gifts, gloves, Interweave Knits, patterns, presents, sweater, Sweater Challenge | Permalink. I finished the beret in the past week but haven’t been home during daylight hours to snap a photo for you. Here it is. Please forgive the poor lighting; the funny, close-up of my head; and the bad photo styling. I’m doing what I can with what resources I have! I think this would look better with a lighter weight yarn. This is also wool, so I’m sure some washing will felt this right up. The pattern is by Jennifer L. Appleby and is from Interweave Crochet’s Winter 2007 issue. I found it to be a fun, quick pattern, though there were a few mistakes in the pattern copy I have. Either that or I managed to create more treble crosses than the pattern called for, but that didn’t mess up any of the other steps and the pattern came out without much trouble. Here’s a close-up of the brim and the treble crosses. I like the contrast between the two. I would definitely recommend this pattern! Using the same yarn (Lion Brand Fishermen’s Wool) I’m making David A., a friend, a pair of fingerless mitts, using my Hubby’s Fingerless Mitts pattern. David’s hands are longer and wider than my husbands, so I cast on 40 stitches (for a large size) instead of 36 (medium). 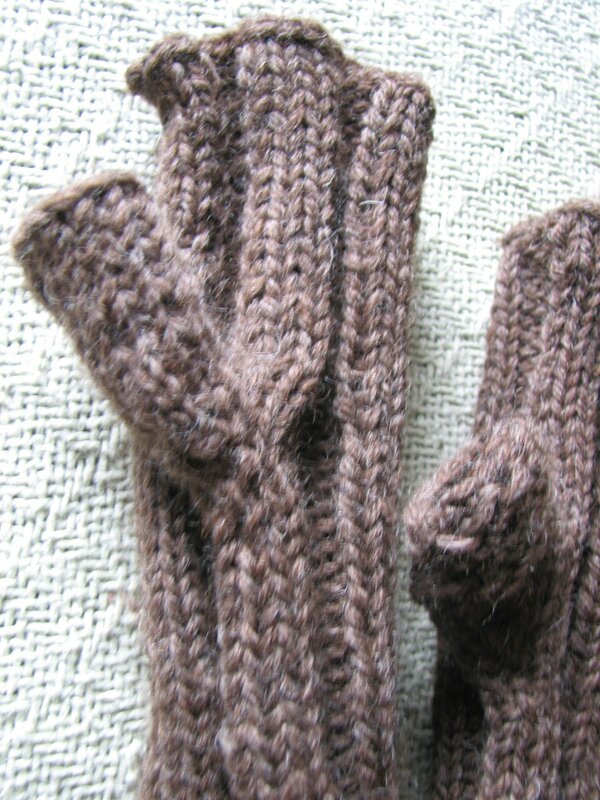 I may knit more than 40 rows before beginning the thumbs and palm sections since David’s hands are somewhat longer. I don’t know how much longer I need to make it though. A knitting/crocheting goal for the year: six sweaters! What’s Needlin’ Ewe, which I wrote about here, is hosting a 2011 Sweater Challenge and I think I’m going to participate! The store is challenging knitters and crocheters to complete a sweater every two months through December 2011. That means six sweaters in 12 months. Only one of them can be a baby or child’s sweater; the rest must be adult-sized garments. They can, however, be summer, winter or fall garments and that includes tanks and cardigans! I have several patterns running through my mind and I’m trying to decide which ones I want to tackle. Categories: Beth's Crafty Things | Tags: beret, challenge, crocheting, gloves, hat, knitting, patterns, sweater, what's needlin ewe | Permalink. Just peaking peeking in quickly to say “hi.” I’ve been busy working on Christmas projects, a fall sweater (need to get that done a.s.a.p.!) and Christmas shopping. While this as been going on, I’ve also been enjoying Embellish Knit Month over at Grosgrain. I love seeing how Kathleen alters various sweaters and cardigans she find at thrifts stores. It’s very interesting and inspiring. I’m also anxiously waiting for the new CraftSanity magazine that Jennifer Ackerman-Haywood has been working on for a bit. She gave a quick update today and I can’t wait to see the finished product! Categories: Beth's Crafty Things | Tags: crafts, CraftSanity, grosgrain, knits, magazine, projects, sewing, sweater | Permalink. It was cold enough today for me to put on a sweater! The first sweater, in fact, I’ve ever knitted. Note the “I Voted” sticker on the collar. I cast my absentee ballot today. Make sure you get out to the polls on Tuesday! If you can’t vote that day, there’s still time to cast an early ballot. Categories: Beth's Crafty Things | Tags: fall, knitting, sweater, vote, winter | Permalink.